Get Access to Your CRAZY Web Special Offer! Master Ebrahim Saadati has been training Taekwondo since 1979 when he was only 7 years old in Tehran, Iran. He was mostly encouraged and trained by his older brother Rahim who was a blue belt at that time. Master Saadati for the first time joined Master Hassan Maleki''s Taekwondo club in 1980. He won his first gold medal in sparring competition at provincial championships when he was a blue belt. He dedicated himself to intense training and participated in many Tkd competitions. He achieved his black belt when he was 12 years old. Entering in to a blackbelt world created new and exciting challenges for master Saadati; challenges such as extreme tactical training with focus on Sparring competitions. The Balancing act between his School, work, family and friends versus his Tkd career posed as the most difficult obstacle to overcome. However, Master Saadati, even as a young man was determined to achieve everything he ever wanted, and he knew that there were sacrifices to be made. Master Saadati had a strong spirit, and his perseverance that led him to win gold medal in Iranian Junior national championship in 1985. He won first place at junior National championship for 3 consecutive years. When he was 16 years old he participated in adult division and won 3rd place at National championships. He was invited to the National training camp for the International Fajr competition where 15 countries participated in 1988. He was selected as a National B team and he achieved bronze medal by losing at semi final to Korea at his first International adult competition. At that time master had gained great deal of popularity in Iran, and that in it self posed different challenges; nevertheless, he stayed humble as he always was, and gracious to his friends in school and especially never misused his Taekwondo skills to hurt anyone. In fact master Saadati encouraged many of his school friends to stay away from bullying, Alcohol, drugs, school fights and directed them towards a healthy life style. He also assisted his master by instructing his classes. He introduced new training techniques and shared his knowledge and experience to increase the level of energy and training in his club. In 1989, Master Saadati became a member of Iranian National A Team and won first place at the International Fajr tournament. He continued to compete at National and International championships and in 1994 he won his first Olympic medal, he won the Silver medal at the Asian Olympic Games. 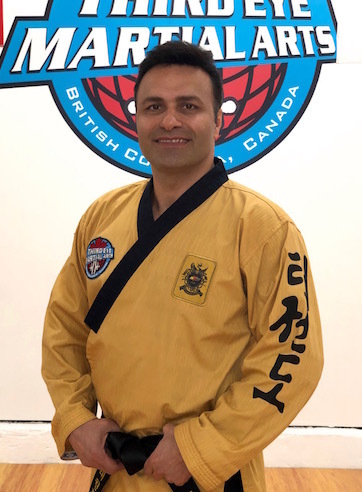 Master Saadati immigrated to Canada in 1995 and started to train and teach at Chen''s Taekwondo in Vancouver. He worked part time, studied the English Language and started taking computer courses in Vancouver community college. In the mean time he kept up with his Taekwondo training and competed at BC provincial and Canadian national championships. In 1998 he became the Canadian Champion in the welter weight division in Saint John, New Brunswick. Since then, he established Third Eye Taekwondo and focused more on teaching and helping new Taekwondo followers. ©2015 Third Eye Martial Arts Studio.